Star King is just the place to get in on this genetic rarity thanks to Jackie Yoo, whose family have been in the meat processing business for years. Not only is the Piedmontese beef sparingly but beautifully marbled, it’s surprisingly tender in texture and pure in taste. 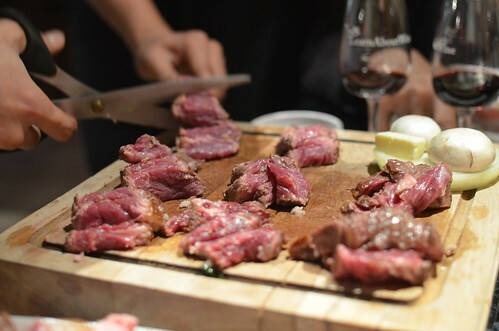 At an excellent Learn About Wine event with a tasting led by Ian Blackburn, I got the chance to try the beef in a couple different preparations. I’d highly recommend both: As tartare and in the form of a grilled, Tomahawk Ribeye steak. 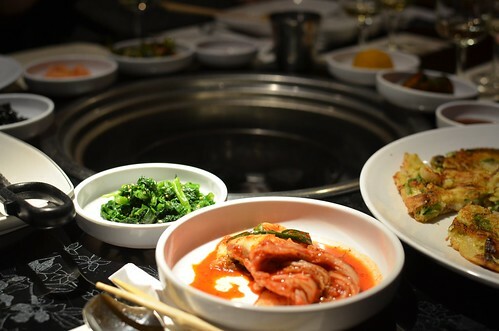 The high quality and varied banchan (Korean appetizers) that precede and accompany the main event are a welcomed diversity of flavors to enjoy with the beef. You’ll also want to add the crispy, scallion pancake to your included appetizers. The tartare is julienned Piedmontese, which you combine with the yellow quail egg yolk and pine nuts, which rests on top of the beautiful mound of beef. Mix in julienned pear and slices of cucumber for great, crunchy texture and subtly sweet notes. It’s actually not listed on the menu, so be sure to remember to ask for it. 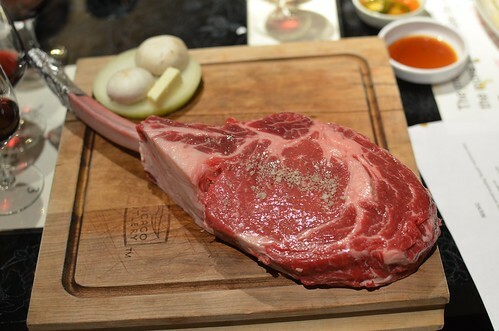 The Tomahawk Steak, however, is not to be missed. 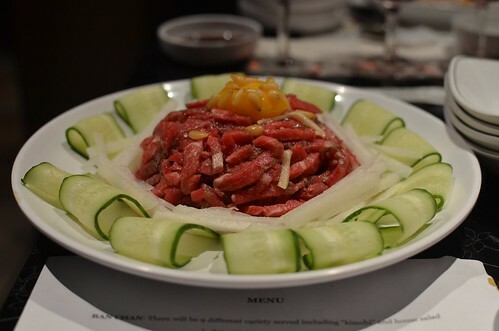 Expertly grilled at your table by one of the staff of Star King to achieve medium rarity, this bone-in masterpiece becomes succulent slices of beef in front of you with the help of a smokeless, soot-fired grill and pair of scissors – as is the advanced art of Korean BBQ. Though there’s a trio of dipping sauces, I used them sparingly if at all – if only to concentrate on the flavors of the beef in its purest form. It’s so good, that however you choose to enjoy it – especially if there’s a sauce you enjoy – is always the right way. Even better: There are also traditional Korean BBQ cuts that are available to fire up on the grill should you want to try the beef that way. So if you want to do your meat up in Koreatown, the Piedmontese cuts – whether Tomahawk, tartare, or traditional Korean style – at Star King are the occasion to do just that. This entry was posted in Food, Koreatown, L.A., Pairings, wine and tagged beef, cow, Food, Ian Blackburn, italy, Jackie Yoo, Koreatown, L.A., Learn About Wine, Piedmontese, steak, wilshire blvd. Bookmark the permalink.